I ran three times last week! Not far, but it’s a start. I think my symptoms of PHT have improved enough that I could try walking significant distances again. Today I walked 4.5 km around Pyrmont Bay on my way to work in Rat City. Even at night (03:30) when I am going to work, it’s a pleasant, quiet walk through this area. There are a few noisy individuals around the 24-hour venues in the area: The Star (casino) and the Pyrmont Bridge Hotel, but the gamblers and drunks don’t venture far away from their source of pleasure and for most of my walk I only have my own thoughts for company. I guess it will take a few weeks before I can judge whether the walking exacerbates the condition. Watch this space for my conclusion. At last. After around 6 months of almost total rest for my hamstring tendon, I can perceive that there is significant improvement. I still stand up at work almost all day, but on the occasions I do sit down (and including at home and in the car), I haven’t noticed any significant pain in the last several days. Also I can walk at a moderate pace with no symptoms. Of course, my first response is to try some longer distance walking to take advantage of this improvement and stop myself putting on more weight. I think, however, that it might be prudent to wait until I can string a few weeks together without any symptoms before I start increasing my activity. That last thing I want to do is cause a relapse. I continue to do stair climbing as my sole form of exercise and it seems to be helping, or at least maintaining, my quads strength, while not exacerbating the hamstring tendon. Twelve floors x 4 repetitions, five days per week. Sitting, especially in a car, causes my hamstring tendon at the ischial tuberosity to hurt. My employer has been generous enough to supply me with an Ergotron standing desk adapter so I can either sit or stand to work on my computer. So now I stand up for my writes, and reads. Does it help? Maybe. 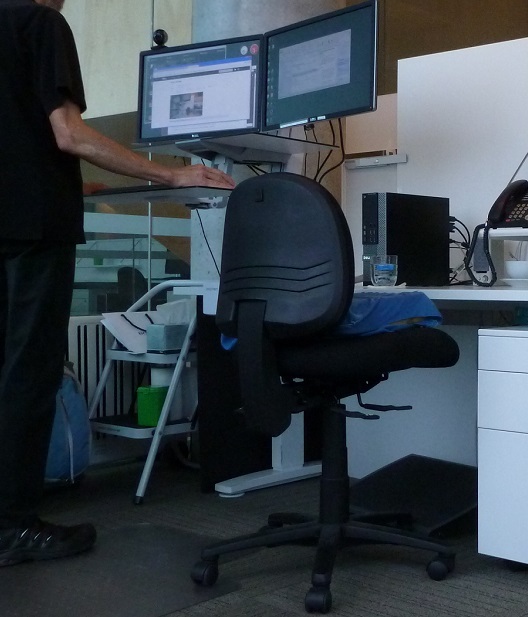 It certainly stops the pain from my PHT while I’m working, but of course my legs get tired during the day. And although sitting hurts, I’m not sure whether the compressive load on the tendon while I sit would make the condition last longer, or just be more uncomfortable while it does last. And see that blue cushion on my chair? 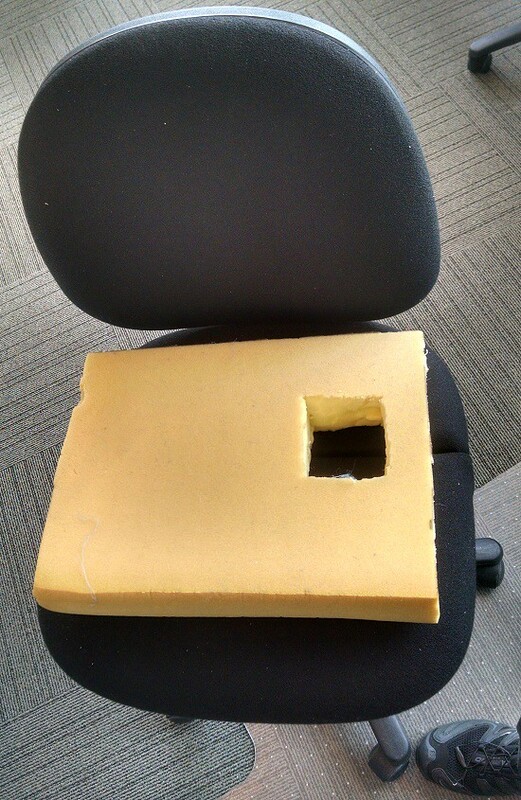 I have cut a hole in a piece of foam to take pressure off the left ischial tuberosity, so when I do sit, it’s more comfortable. I sometimes still wonder whether there’s also an element of ischio-gluteal bursitis in my condition – perhaps I have both PHT and IGB? The cushion cut-out should help with IGB, and otherwise the treatment would be the same: rest. I may have PHT, but I’ve found I can still exercise. 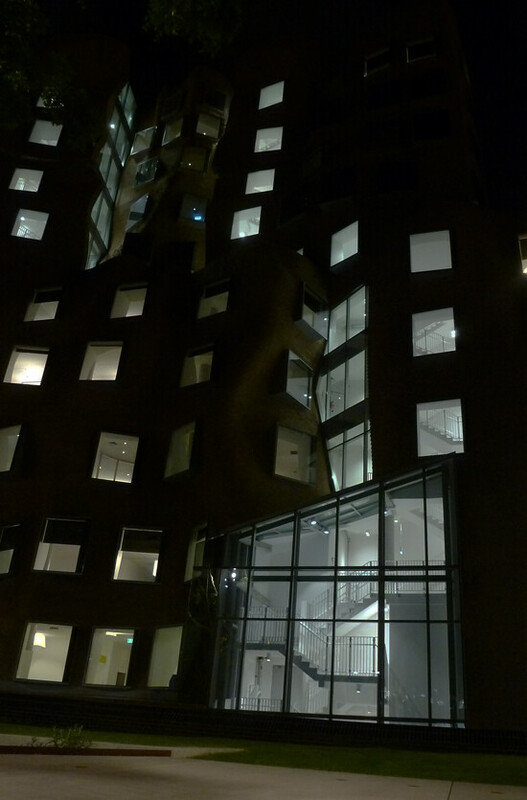 I climb up and down the fire stairs in this building. Four times up (to level 13) and down. 1100 steps altogether. 30 minutes exercise. I think the key to exercise choice is that is must be targeted at the quadriceps muscles, to help ensure that the hamstrings remain inactive. Just doing this exercise and not doing any cycling seems to have allowed a small but detectable improvement this week. Today I can bend forward to touch my knees without the PHT pain, whereas I couldn’t do that a few days ago when I was still cycling. There is, however, considerable day-to-day variation in my symptoms, so it’s probably premature to declare this exercise to be safe. My plan is to continue till the end of January and evaluate it more formally at that time. I have PHT from long distance running. I thought I could rest my hamstrings but still exercise by cycling. There’s at least one person who reckons cycling causes Proximal Hamstring Tendinopathy. Paul Visentini is a physiotherapist who has some interesting data and ideas. He wrote an article on muscle activation in cycling in which he talks about cyclists getting PHT. Although I am not convinced about all the factual backing for this, there is some evidence and it seems likely that at the very least, cycling is not the benign activity I assumed it to be (especially at faster cadences?). My PHT seemed to be slowly improving until I started cycling – although this could be just a coincidence. To be on the safe side, I have given up cycling until my PHT is cured (but if I ever get to that point I could run instead!). Maybe I’ll get rid of my bike? Is compressive load a factor..? Partnership | darkne… on Cycling causes PHT too? oldblack on Cycling causes PHT too? Debbie on Cycling causes PHT too?